Cubist Jewelry - This is an artistic handcrafted sterling silver statement collar necklace that is constructed from geometric shapes of silver tubing that are soldered individually within a frame. 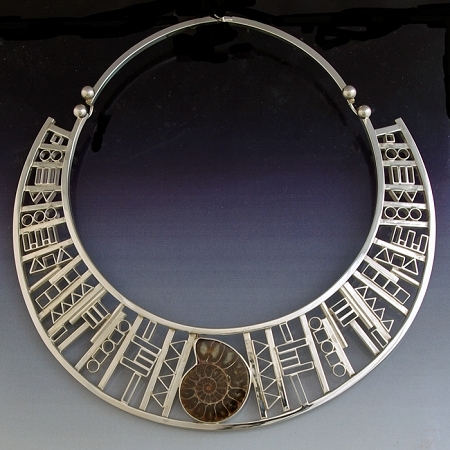 The intricate choker frames a ammonite fossil (35mm x 28.5 mm). From our Cubism Collection, this is a handcrafted sterling silver statement collar necklace is bold and beautiful. The intricate collar is constructed from over 100 various geometric shapes of silver tubing that are soldered individually within a frame. 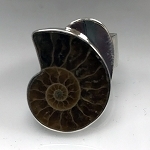 A special feature in this unique design is a natural ammonoid fossil. 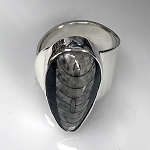 The four hundred million year old Moroccan fossil is fully bezeled in sterling silver. The collar has a drop of 1.5" wide in the front and tapers to .75" on each side, and fits a 16" neck comfortably. The clasp closure is an Aaron original. The ammonoid fossil is 1 1/8" wide x 1 3/8" long. This is a One-of-a-Kind choker.